Basel is generally considered to have been founded in the year 1102, and it is believed that this picturesque castle, located just a few kilometers away, existed since around the beginning of the 11th century. 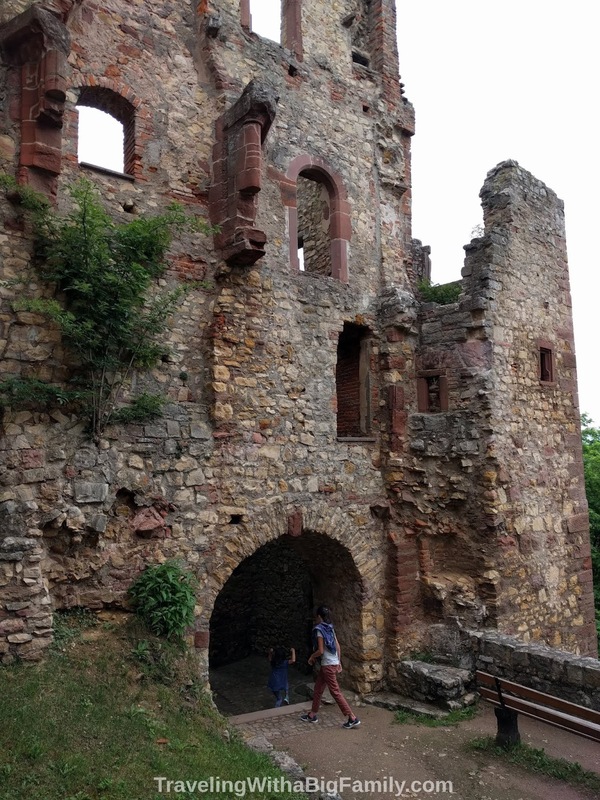 It has two towers, big thick walls, and courtyards, and is an awesome medieval castle to visit with your big family. 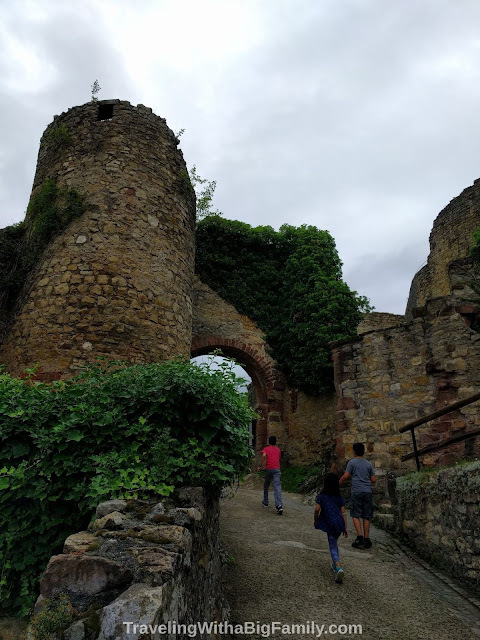 For castle fans, it has a fascinating history: it survived a siege in the year 1332 (settled by compromise), only to be severely damaged during an earthquake 24 years later. It was raided during the peasant uprising of 1525, and at the end of that revolt, the peasants were briefly in control of the castle (I'm sure there were lots of "Woo-hoo, lookit me, I'm a fancy gent!" exclamations by the farmers strutting around the castle). During the Thirty Years War (1618-1648) it was attacked and damaged, and fell under the control of the Swedish forces and also at one point was in the hands of the Imperial forces of the Holy Roman Empire. It was "destroyed" (severely damaged) by the French in 1678. It's been a subject of preservation efforts since the 1800s. We stayed in St. Louis, France (the French side of town, across the border from Basel, Switzerland). St. Louis is the same town where Basel Airport is located, and it has considerably cheaper lodging options than Basel. We stayed one block from Switzerland. While there, our big family had quite a bit of trouble locating a 6-passenger taxi (7 passengers counting the driver) that could accommodate us for the 10 mile (6 km) ride from St. Louis to the castle in Lörrach, Germany. It wasn't impossible, but I did play around on the phone, searching for cab companies online and making calls, for about half an hour, and we nearly ended up just booking two taxis for our family. We were told everything from "We can pick you up in 2 hours" to "You should have called last night" and "We don't have anything that size." There aren't many options for large cabs in St. Louis. During our brief stay, we used a 6-passenger taxi four times, and every single time, it was the same driver who (eventually!) showed up. If you prefer to all ride in one vehicle, as we do (so that you can stick together, and pay less than the cost of two taxis), it's advisable to order your vehicle the evening prior to your planned trip. A historical preservation society maintains and operates the castle now, and the hours vary by season. While there, you might check to see if there are any plays or concerts in the schedule (those are typically done in the summer). I've read that you can tour the lower part, for free, at any time, but if you're coming all this way it would be worth making sure the higher reaches will be accessible too. The stone stairs are very old, of course, and some of them are worn down with the passage of time (and many, many feet), so slippery flip-flops would not be a good choice. The littlest ones might need to be reminded to go slowly and hold on to the rails and walls where possible, especially when going down a long flight of stairs. This was our only European border crossing that didn't involve being on a train or in an airport, so I was a little worried about whether we would have to bring our passports for any reason. I knew the borders were open, but thought they might still spot-check passports (kind of how they randomly search bags even if you're in the "nothing to declare" green line at the airport). But nope. We didn't see any border control between St. Louis, France, and Lörrach, Germany (on the way there) nor between Lörrach and Basel, Switzerland on the way back. At the suggestion of our host in France, we left our passports behind for this quick day visit to Germany. As with all international travel, it's a good practice to keep a photocopy of your family's passports with you at all times (whether for proof of identity, or simply for obtaining a child discount on a kid who looks really tall!). There are walking trails in the beautiful Rötteln Forest near the castle. Paths are marked and this makes a great side excursion. There's a hiking trail up from the town of Lörrach to the castle too. 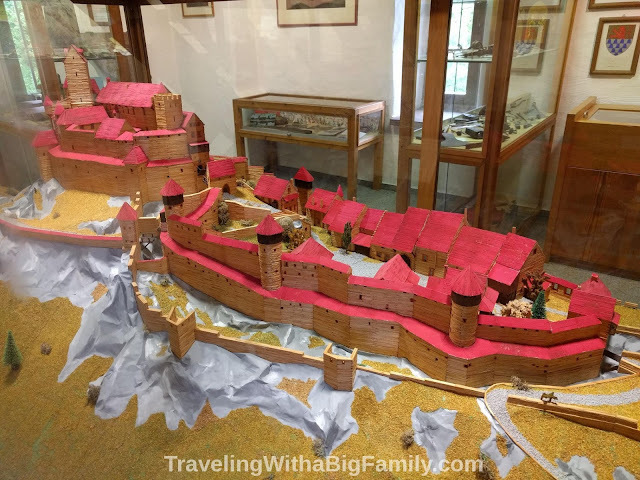 There's an enjoyable museum on-site as well (right after the ticket booth, towards the upper regions of the castle), and our kids could have easily devoted from 90 minutes up to 2 hours just for the museum, if we hadn't stayed in the castle till nearly closing time. Much of the museum is specifically geared towards children, and there are toys and things they can actively do, not just stuff to see. The fee window and museum are laid out so that you are supposed to go to the museum first, then go see the castle. 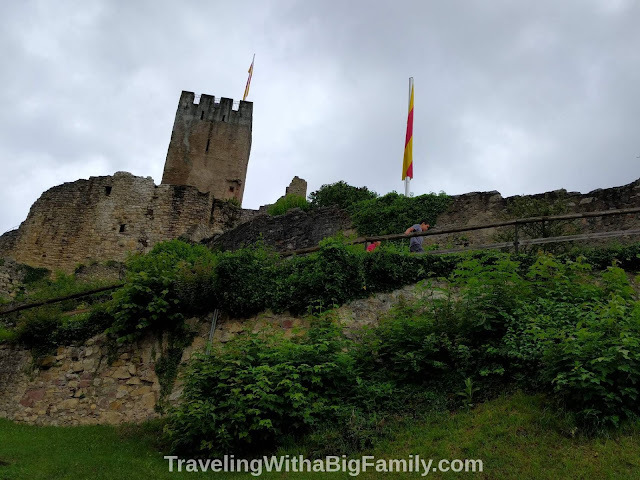 We arrived early in the day, and it looked like rain, so we wanted to see the castle while it was empty (and dry). We planned to come back and check out the museum on our way out. This confused the ticket lady to a considerable extent. Apparently this is a tactic that is just "not done." When we tried to pop back in to the museum (without paying a second time), we had to persuade her and another employee that we had in fact paid earlier in the day (I don't recall being handed any tickets or proof of purchase) and that we weren't trying to barge into the fee area without paying; we simply had rushed through it and wanted to come back and see it at the end of our visit. Once she understood that we had just come from the castle, and just wanted more time in the engaging museum, she relaxed and granted us permission. I was surprised by reading several reviews that said some people only visit the lower regions of the castle. The entrance fee really is nominal - unlike a great many other places in Europe - and the view from the top is very nice. You can even see Basel in the far distance. 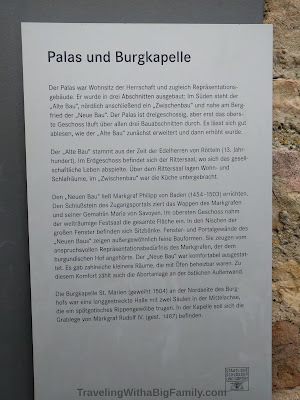 There were plenty of signs throughout the castle with informative descriptions, but 100% of it was in German. If, like us, you don't speak a word of German*, you might want to read up about it online before you visit. Ah, "Palas und Burgkapelle, yes, yes, I see..."
We all loved our fantastic meal at the castle's cafe, Fräulein Burg Café und Biergarten. I really like good, hearty, simple food, and this fit the bill perfectly. It was one of my favorite meals in Europe, in fact. The food was country-style, straightforward, and completely unpretentious (example: a delicious piece of meat on a plate. Accompaniments: fresh bread, with garlic butter). 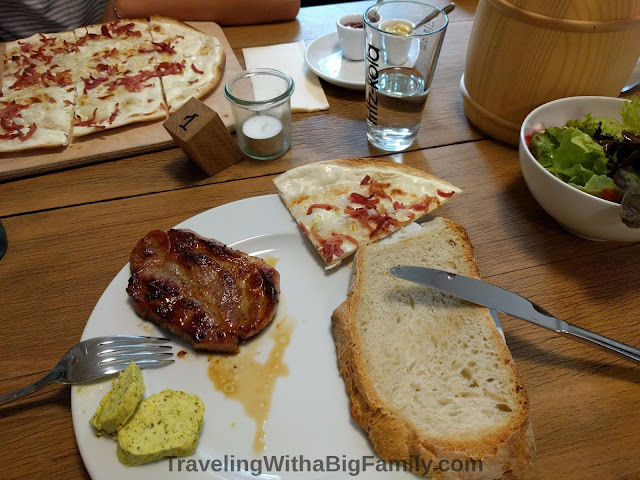 The flamm klassisch - basically, similar to a type of thin pizza - featured fresh local cheese. The kids enjoyed the grillwurst. They had several good dessert choices too. The cafe also had super-reasonable prices (few restaurants in Europe are what I'd call "cheap," but, this was one of the least expensive meals we had in Europe). It is run by the city. The staff was very friendly and helpful with our selections (and our waitress was fluent in English, fortunately for us). We all remember this meal as being very tasty. 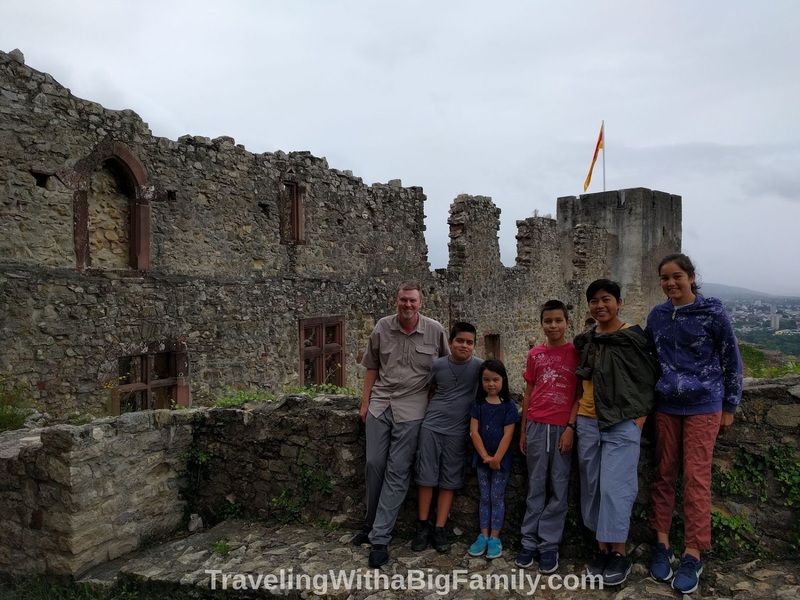 Rötteln Castle is a fantastic way for a big family to spend a morning or afternoon, regardless of whether you're staying in Lörrach, Germany, or St. Louis, France, or Basel, Switzerland. 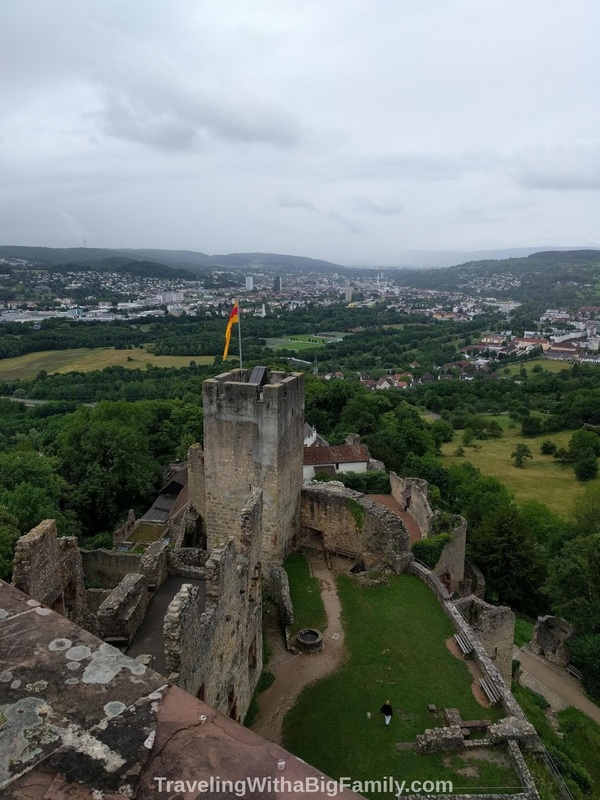 It's easily worth a 90-minute or 2-hour round trip drive to see it, and fortunately, if you're staying in the Basel area, it's more like a 15-minute drive. I'd put this at the top of my list of activities for the Basel area. *It's not exactly true that I don't speak a word of German. I can totally say Good morning, please make it quick and wonderful (Guten morgen, bitte, mach schnell und wunderbar). This is not a phrase I expect to come up a lot in conversation, but you never know.